In a dramatic turn of events, wrestler Narsingh Yadav was on Monday cleared of any wrongdoing by a National Anti-Doping Agency panel, paving his way for participa tion in the Rio Olympics. Yadav , whose samples taken on June 25 and July 5 had tested positive for a banned steroid, convinced the panel that he was a victim of “sabotage“. “There is no fault or negli gence on his part and he is a victim of sabotage by a competitor.... 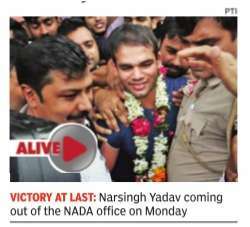 The panel exonerates the athlete from charges of violating anti-doping rules,“ NADA chief Navin Agarwal announced to a huge cheer from Nar singh supporters. “I hope this matter doesn't get suppressed...The real culprit should be brought to book,“ the wrestler told TOI. The NADA panel members are law yers, former sportspersons and medicine experts. If the doping offence had been upheld, Narsingh was staring at a four-year ban.His blood samples were found negative but urine sample had contained methandienone, an anabolic steroid. Since the samples collected on different days contained the same banned substance and as Narsingh was not notified about his first sample testing positive before the second sample was taken, as per the WADA rules, the two positive tests were considered as one infringement.